Founded in 1855, Street & Smith Publications, Inc. was one of the more successful publishers of what was commonly referred to as pulp fiction or dime novels--inexpensive periodicals readily affordable to the common man. While the founders, Francis Street and Francis Smith, died between 1883 and 1887, the publishing house they founded went on to over 80 years of publishing romance and adventure novels, fiction digests, and ultimately sports digests and magazines. Street & Smith was purchased by Condé Nast Publications in 1959. Condé Nast continued to publish Street & Smith's popular pre-season sports almanacs until 2007. 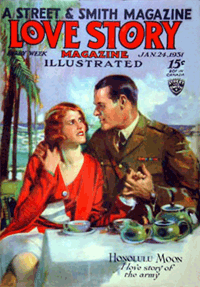 As noted above, Love Story Magazine sponsored Radio programs between 1931 and 1939. 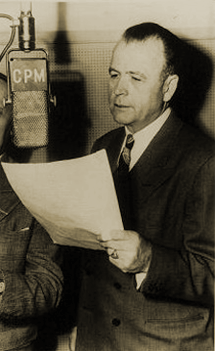 Street & Smith sponsored Radio programming between 1928 and 1941. 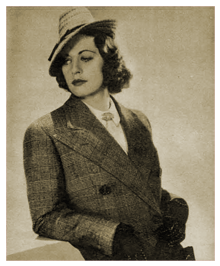 Love Story Magazine's female personality over Radio was intended to be lovely, versatile Lucille Wall, who first served as the Collier's Hour 'Love Story Girl' between 1929 and 1931. 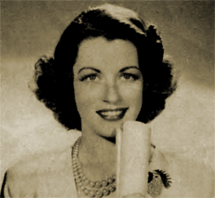 Lucille Wall was later remembered as Portia in Portia Faces Life, a popular, long-running serial melodrama that ultimately aried from 1940 to 1951. Though never identified during the series' initial fifty-two Love Story Dramas, the 'Love Story Girl' had been identified in newspaper articles of the era as 30-something Lucille Wall, a talented and attractive Radio and Stage actress who went on to a dramatic career spanning almost 60 years. She last appeared on Television during the 1982 season of General Hospital. Lucille Wall was featured in General Hospital as nurse Lucille March Weeks when it first debuted in 1963. But Lucille Wall never actually appeared in the Street & Smith-sponsored Love Story Dramas series. Portraying 'The Love Story Girl' for Street & Smith would have obligated her to perform in two, similar Love Story magazines of the air--The Real Silk Program and Love Story Dramas. Street & Smith demanded exclusivity of Lucille Wall's services, but Ms. Wall couldn't break her other contract. So despite the ballyhoo regarding hints of Lucille Wall's portrayal of Street & Smith's 'Love Story Girl,' the two parties went their own way. The scripts for Love Story Dramas were adapted "with the permission of Street & Smith and the editors of Love Story Magazine." It would have been an excellent opportunity for Lucille Wall. As things turned out, several other young actresses ended up portraying "The Love Story Girl" for both the 1931 Love Story Dramas that included a 'Love Story Girl' and the entire 1936 canon of Love Story Dramas that succeeded them. The 1936 Love Story Magazine adaptations that briefly aired in the Midwest over NBC affiliate stations were transcribed and syndicated by MacGregor and Sollie, and pressed by RCA. MacGregor and Sollie was then a San Francisco-based electrical transcription house that often worked with the major networks of the era, as well as recording, pressing and marketing their own syndicated Radio programming features. In the case of the 1936 MacGregor and Sollie syndicated run, Street & Smith's Love Story Girl was featured in every 15-minute episode of the twenty-six episode series. Love Story Dramas was probably recorded and pressed during the Summer to Fall of 1935. Run Dates(s)/ Time(s): 31-10-01 to 32-09-22; CBS; Fifty-two, 15-minute programs; Thursdays, and 9:30 p.m.
Sponsors: Street & Smith's "Love Story Magazine"
Recurring Character(s): The "Love Story Girl"
Honest Radio History research is hard, painstaking and time-consuming work. It's tedious, often exasperating, and demands a great deal of thinking outside the box as often than not. Or . . . if you're the OTRR or one of the other shabby commercial OTR sellers, you can simply lie about a canon's history and just phone it in. Lying about a canon's history and just phoning it in is the OTRR's traditional modus of choice. It's sure a lot easier the OTRR's way in any case. It requires no real historical research whatsoever, and requires no effort beyond cutting and pasting. So it should come as no surprise to anyone who actually cares about American Radio History that the OTRR's 'Certified Complete and Accurate' set of Love Story Magazine is a completely baseless and utter pack of lies. Plaigerized lies at that. The radioGOLDINdex is a database of predominately transcription discs and tapes--or so it's represented, in any case. The radioGOLDINdex's Love Story database is comprised of a specific set of transcriptions that bear a sequential series of twenty-six, 1937 dated transcriptions that were never ever actually broadcast in 1937. We have no idea when the radioGOLDINdex's set of transcriptions actually did air--you'd have to ask the radioGOLDINDex--but it certainly wasn't in 1937. Nor could that set of transcriptions have possibly aired in 1936, since they're all labeled with 1937 dates--at least a year after the canon actually did first air in the Midwest. The OTRR's purported 'Certified Complete and Accurate' broadcast dates are a complete sham. The OTRR knew in 2009 when they pronouced that set 'Certified Complete and Accurate' that its purported broadcast dates were a complete and utter lie, but they misrepresented the set anyway--to tens of thousands of unwitting archive.org downloaders. The OTRR has no standing whatsoever when it comes to honest, accurate Vintage Radio Research. And to our way of thinking anyway, the OTRR's repeated pattern of naked misrepresentations about American Radio History needs to stop. Sadly, their comparative success in perpetuating the 'big OTR lie' about virtually every canon they 'certify' has as often as not become accepted as fact throughout the predominately incurious members of the OTR Community at large. American Broadcasting History's loss is--yet again--the OTRR's shabby gain. This continuing nonsense will never ever end well for the history of this national treasure. WCAU 9:30 Love Story Hour. WMAL--9:30 p.m.-- Love Story Magazine Hour. WCAU 9:30--Love Story Hour, "Shopping for Love." WCAU 9:30--Love Story "On the Sand." WCAU 9:30--The Love Story Hour. WNAC 9:30--Love Story Magazine Hour. KTFI--8:30 Drama  "Bitter Triamph"
KTFI--8:30 Adventures of "Flash Girls"
KTFI--8:30 Drama: "A Prince Arrives"
KTFI--9:00 Drama: "A Prince Arrives"
KTFI--9:00 Drama: "A Toast to Cinderella"
KTFI--9:00 Drama: "The Difference Between"
KTFI--9:00 Drama: "Accent On Perlith"
KTFI--9:o0 Drama: "Nola Says I Do"
KTFI--9:o0 Drama: "Some Men Are Different"
Education: Academy of The Sacred Heart, Washington, D.C.
OF RADIO'S "LOVE STORY GIRL"
New York, (AP)--Lucille Wall, who once tried to hitch her wagon to a musical star, now is the "love story girl" of radio. There was a period in her teens when ambition was strong within her to be a concert pianist. But her enthusiasm wilted when, after laboring for weeks to achieve something like a correct rendition of a certain piece of music, she heard Paderweski run through it perfectly, with no more effort than a loss of his locks. Miss Wall's later ambition to be an actress found no such discouragement, however. And her career led to radio. Now she is cast for heroine parts in radio drama, particularly the Sunday night WJZ series of Uncle Henry and the editor, where she always is the more or less love sick young woman. In her radio experience of four years she has played more than 500 roles. Miss Wall has a middle name, Loretta, which she uses only occasionally. She was born in Chicago, but has spent her latter years in Washington and New York. After attending the Academy of the Sacred Heart in Washington, her determination to go on the stage overcame parental objections. To her listeners, who send her stacks of mail, including many a proposal, she is the "love story" girl. Miss Wall is good looking--and unmarried. Lucille Wall, who as Portia Blake faced life on radio for nearly 12 years, much to the delight and concern of millions of soap opera fans, has died. She was 87. The veteran actress, who later established herself on television as the venerable head nurse on "General Hospital," died at a Reno, Nev., convalescent home. Although she won a special television Emmy for her portrayal of nurse Lucille March at an age when most actors would have been happily retired, it was as Portia in the long-running "Portia Faces Life" that she will be best remembered. "We got hundreds of letters and calls when she first went on television," said Kylie Masterson, a former associate producer of "General Hospital." "People had never seen her face, but they recognized her voice from radio and wrote to ask if she had indeed been Portia." From 1940 until the program went off the air, Miss Wall was briefly the supportive wife and then grieving widow of an idealistic young attorney who briefly battled the corrupt elements in control of the mythical city of Parkerstown. But her husband was mysteriously killed after a single episode while warring with Parkerstown's political boss, and Portia, also an attorney, was left not just to continue the crusade but to raise their young son, Dickie. It was, as the announcer said five days a week, "a story reflecting the courage, spirit and integrity of American women everywhere." The program's popularity with American women gave it top ratings. 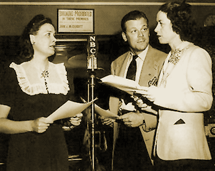 From 1940 until 1952, when television doomed radio serials to the entertainment archives, Portia survived a remarriage (to the "brilliant, handsome" journalist Walter Manning); World War II (when Manning was alternately accused of being both an American spy and a Nazi sympathizer) and accusations that she was carrying a child fathered by another man. A lesser woman would not have endured, but Portia (named after the heroine in Shakespeare's "Merchant of Venice") not only endured, she also proved a master of deception. For 45 minutes prior to the time she became the sophisticated Portia, Lucille Wall had been heard as the uncomplicated Belle Jones, wife of "Lorenzo Jones," a garage mechanic whose simple, comedic homilies brought mirth to late afternoon America. Both programs originated at the NBC studios and ran for roughly the same number of years. Miss Wall said that none of her millions of listeners ever realized she played both the completely disparate roles. Miss Wall began her career in Chicago with the Ralph Bellamy Theatre Players and before landing roles in "Portia" and "Lorenzo Jones" was heard on "Pretty Kitty Kelly," "Sherlock Holmes," "True Confessions" and "Your Family and Mine." In the early 1970s she was interviewed by Richard Lamparski. She disclosed that in 1952, when Portia's death knell was sounded by the network, the program's writers concocted a scheme to keep the show on he air. They contrived a situation in which Portia, who had saved the lives and fortunes of countless hundreds over the years, would be framed and convicted on trumped-up charges. Surely, the writers reasoned, public outcry would force the series back on the air, if only long enough to free the source of their income from prison.